Four dead, nine injured after driver plunges truck off San Diego bridge. Four people were killed and nine others were injured Saturday when a suspected drunk driver lost control of his pickup truck, plunged off the San Diego-Coronado Bridge, and plowed into a crowd gathered at a festival below, authorities said. 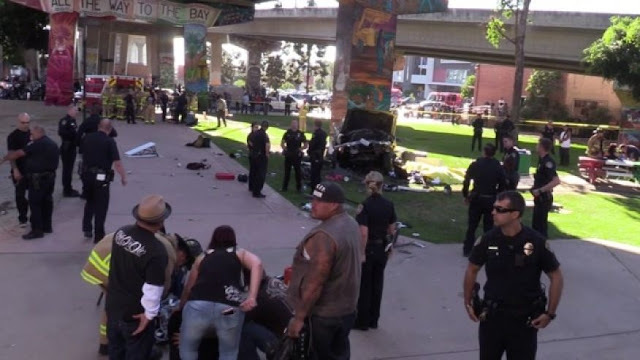 The California Highway Patrol said the driver, 25-year-old Richard Anthony Sepolio, struck a guardrail and fell 60 feet before landing on a vendor booth set up for a motorcycle festival in Chicano Park. Sepolio was taken to the hospital with major injuries and will be arrested on suspicion of driving under the influence causing deaths and injuries, California Highway Patrol Officer Jake Sanchez said. Authorities said Sepolio is an active-duty member of the U.S. Navy stationed at a base in Coronado Island, across a bay from San Diego. The names of the deceased victims were not immediately released, but authorities identified them as a 62-year-old man and 50-year-old woman from Chandler, Ariz., and a 59-year-old man and 49-year-old woman from Hacienda Heights, a suburb east of Los Angeles. Witnesses said all four victims were in the vendor booth that was crushed by the truck.